I grow Paddle Plants in my garden but they make unusual, fascinating & easy care houseplants if you have enough light in your home. 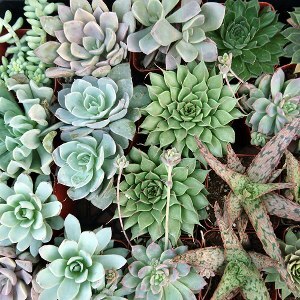 This will help to keep these beautiful succulents looking great. I have a patch of Paddle Plants (aka Red Pancakes, Flapjack Plant and Desert Cabbage) growing in my front garden, but did you know they an interesting yet easy houseplant? Yup, it’s true. I bought this plant direct from the grower right here in Santa Barbara 8 years ago as Kalanchoe thrysifolia but now they say on their website it’s actually Kalanchoe luciae. This happens in the world of plants, but regardless of the botanic name, this plant is 1 to consider if you have bright light and can practice restraint with the liquid love. Here’s my paddle plant patch in the front garden which provides me with lots of cuttings. The 1 that you see in these pics and the video is taken from there. As an experiment, it has lives half of the year inside and half of the year outside. As bright as possible, near a west or south window, but not in it. It’ll burn up against the glass or in the window. As I said, be stingy – overwatering will rot this plant out in no time. 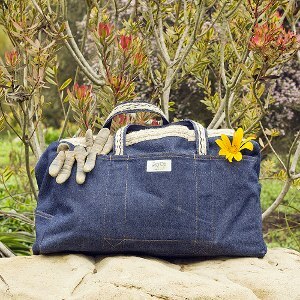 Wait until the soil has almost completely dried out until you water it again. And with all houseplants, water less in the winter. As I always say, if your house is comfortable to you, it’ll be comfortable to your plants. And because this is a succulent, the dry air won’t bother it at all. Once a year is just fine, preferably in spring . 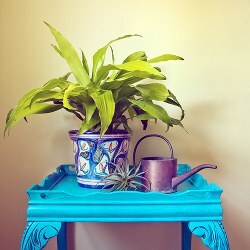 You can use whatever organic fertilizer you use on your other houseplants like Organics RX. Mealybugs are what you have too look out for followed by aphids. 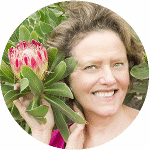 You can find out more about these pests & how to control them in my book Keep Your Houseplants Alive. 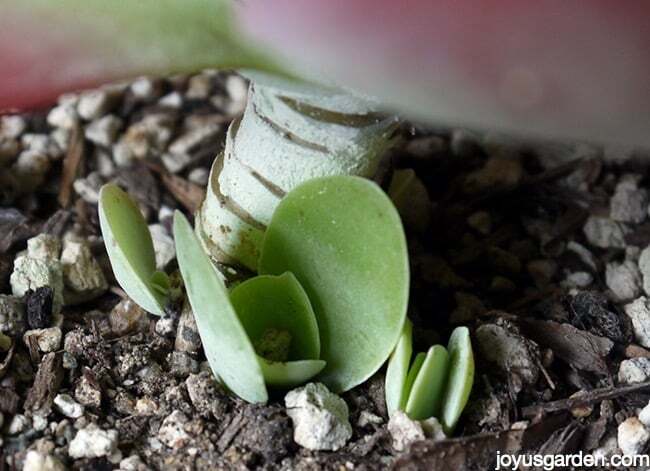 This Kalanchoe luciae will grow slowly indoors, but if you’re patient, it’s definitely worth the wait. 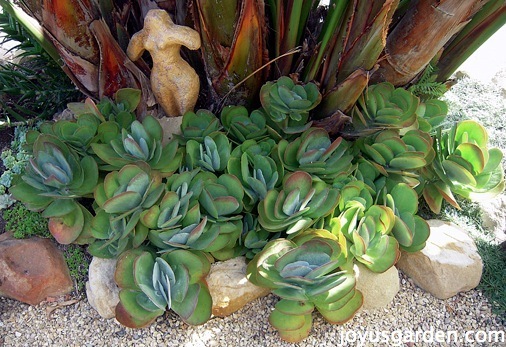 If you travel a lot this plant is a good choice because of its low water and care needs. No need to fuss over this gem of a plant. 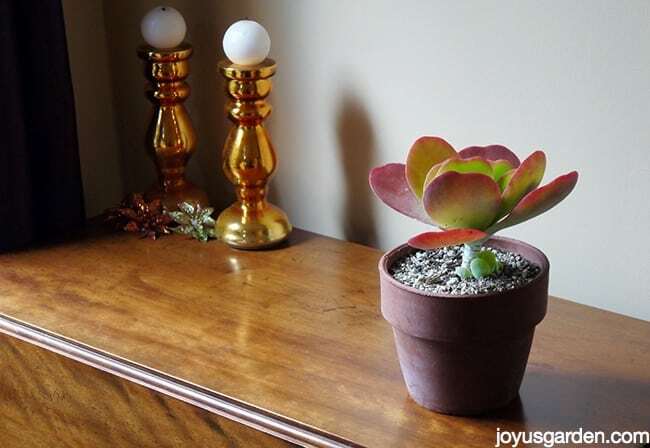 Have any of you grown the Paddle Plant (aka Red Pancakes, Flapjack Plant, Desert Cabbage) as a houseplant? Happy to have found your site. Maybe you can explain to me why the leaves on my Paddle plant are curling. Seems healthy, but I don’t think this is right. I’m such a fan of your blog/youtube. I’m living in Toronto, Canada, and I have a “paddle plant” that sits indoors, near an east facing window. It gets bright direct sun in the morning, and indirect light the rest of the day. I’ve noticed that it’s leaves have lost the red around their edges, and they also droop down, as apposed to standing straight up. Some brown spots on a couple leaves I had white mild dew on main stem but I treated with pesticide from HD. Any idea why Brian sports? Thank you Nell, so sad the huge leaves 8×5″ of my paddle just fell off literally and the 9″ stalk/main stem collapsed the next day once the stalk collapsed I squeezed the stalk and a column of sticky “plant marrow” poked out I also looked at root ball roots looked as they did when I transplanted it 3 weeks ago; the soil was cool but not wet and 3/4″ of perimeter soil and top layer was totally dry. My daughter lives in a very small town in TX, near the Mexican border.. she found this paddle-plant at Walmart — it went from her window sill to outdoors, in a matter of MONTHS!! Bigger than 2-plates!! And she can’t find another! She’s asked at garden shops and have NO clue . She wants to buy more but , Walmart only had that “one”. it has the red markings but , is it really a paddle plant? I’ve been searching everywhere for an answer, but i cant find one. 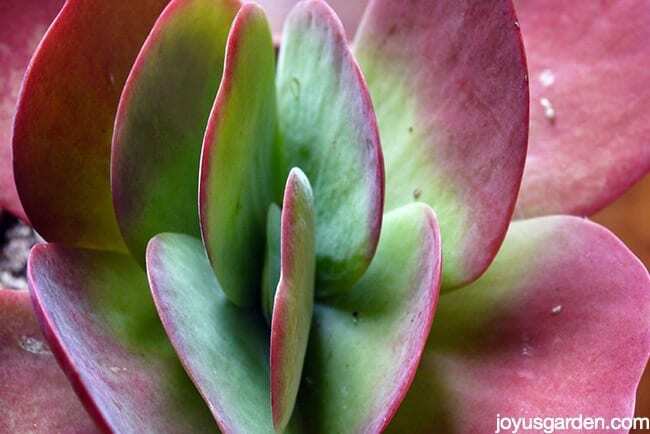 Do you know if Kalanchoe luciae plants have a scent? i swear i can smell something, but the two people ive asked cant. So I have a very happy paddle plant in my college dorm room but I noticed the lower leaves are starting to brown and shrivel up. Do I need to pull these off/do anything or just let them be? Hi Nell, I a Flapjack (not sure if it’s K. thrysifolia or luciae, but over the four months it developed an extra-chalky substance on the edge of leaves and the leaves were looking a bit droopy. I haven’t been able to find any descriptions of such a blight anywhere else but you seem knowledgeable and I hope you can advise. A few other things to know: I kept the plant outdoors but away from bright light for the first two months (bad I know). Then I repotted it into a shallow but wide terra outta dish using pretty rich potting soil (also bad). I moved it indoors to a north facing window. I haven’t over-watered. Today I took it back of the pot, sprayed off the white stuff and will put it in a tighter pot with more sand and in a MUCH brighter window. Can you tell me though what that white stuff was? Will my solutions fix it? I have a houseplant insecticide spray if needed. Thanks! 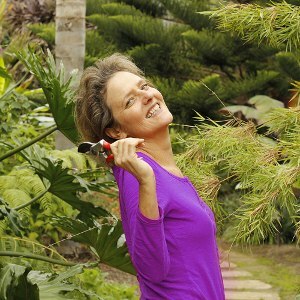 Hi Nell, keep up the good work with the blog and your youtube channel. Is it possible to propagate the paddle plant in December by stem or leaf cutting? Thank you. I live in west Tx and have brought my red pancake kalonchoes inside for the winter. They have grown a stalk abt 5 ft tall with the tiny little yellow flowers. Will I need to cut the stalk off at some point? Thank you. hello! what do you do with the parent plant after removing the pup from the stalk? do you let the incision callous out as well before repotting or can you dab some cinnamon on it and repot without callousing over? thank you! Hello! I have a how to plant that is very slow growing. Used to be in very bright light but I moved to a home that has a Northwest facing window. It doesn’t have any red, but it’s very healthy and it seems to be doing well. I want to put it outside so it can get brighter light, but it only gets to about 50 degrees at night here and 45 right now during the day. Is that too low of a temperature to put it outside to get some direct light for half an hour? Hi! I have a paddle plant and purchased it a few months ago. It looks much worse now, all the leaves are curling downward. One top lead is drying up and all leaves have brown spots on them. How can I save this? I dropped a small paddle plant and broke a few of the leaves in half. What do I do to help it overcome this disaster? Or should I just start over? I am really sad it fell. I am moving to the Tucson area soon and bought this to get started understanding succulents. It was doing very well. I was told that after a flapjack blooms, it dies. Is this true?